Use this button to search the official records as a NON-subscriber. Subscribed? Use this button if you have a subscriber login provided by the county. Need Help? 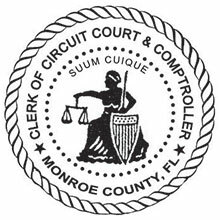 Disclaimer: This website is the Official Website for the Clerk of the Court in Monroe County, Florida and is not affiliated with any other website on the Internet. Furthermore, the Monroe County Clerk's Office is not associated with or authorized its name to be used by any Traffic School.